The title says it all. 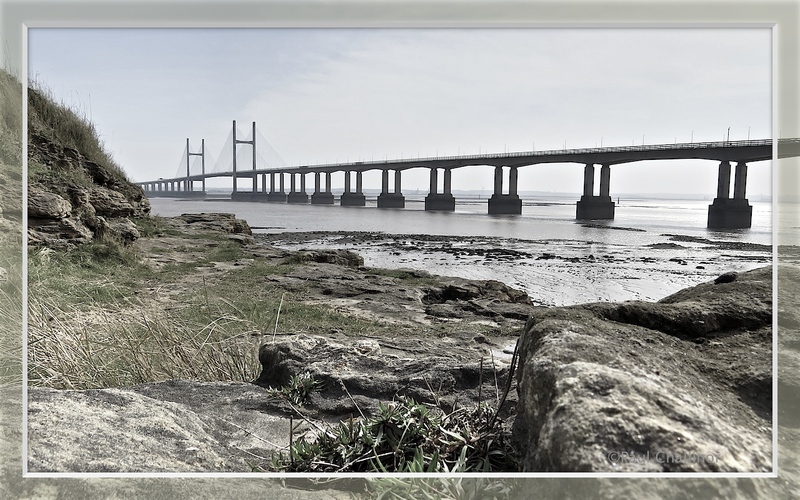 After stating in a previous post that Aunty didn’t want to do any of the boring bits on the coastal path, I mistakenly persuaded her that the section from Portskewett to Redwick would be easy and at least we’d have walked most of the way from Chepstow to Newport. Well it was boring! And Aunty was right in her sentiments – though please don’t tell I said so. We parked the car just South of Portskewett, down a narrow lane, which had a car park and picnic site at the end, right on the edge of the estuary. We did spend any time in Portskewett but moved onto the path straight away. But as there’s very little to say about the walk I’ll tell you a little about the area. A panorama of the estuary. If you look really closely and squint you can see the Old Severn Bridge on the left. The name Portskewett may come from the Welsh Porth-is-Coed, meaning “the harbour below the wood”. During the post-Roman period this was in the cantref, or hundred, of Gwent Is Coed, centred on Caerwent about 3 miles away. A cantref is an old definition of a district or administrative area under the control of a price or chief. An alternative derivation is from Porth Ysgewydd, the port of the elder wood. 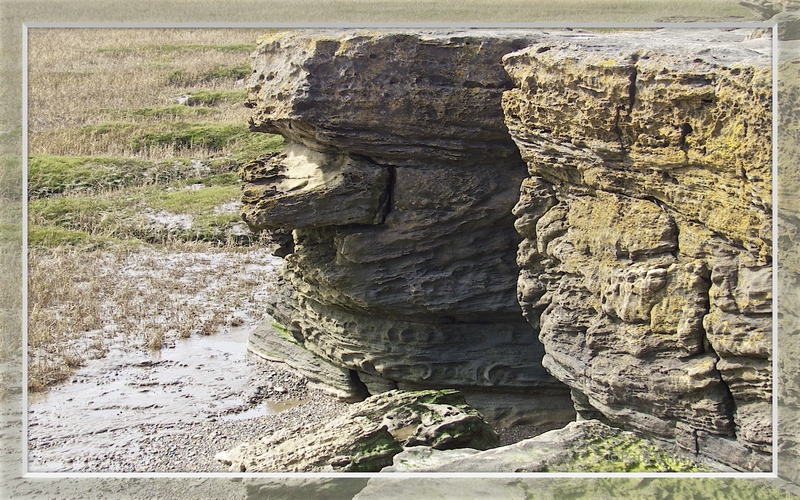 Black Rock, on the Severn estuary immediately south east of the village, has been an important crossing point of the River Severn for many centuries. 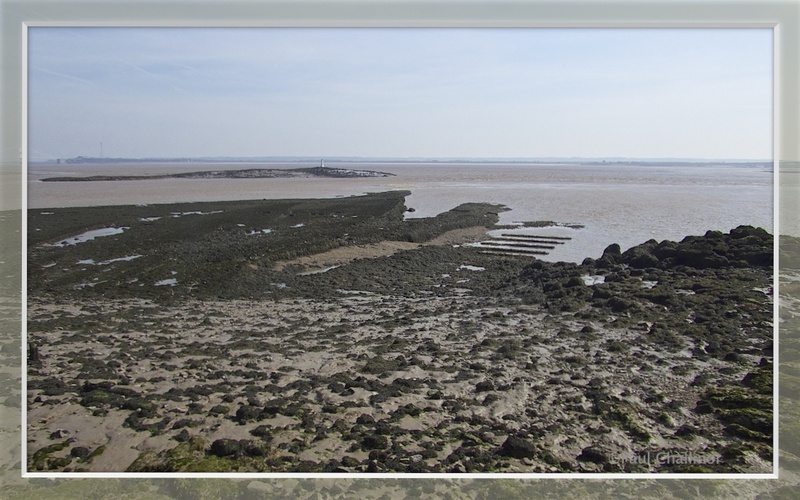 The photo above shows Black Rock to the left, and the Second Severn Bridge to the right. Numerous coins found in the mud show that it was in constant use throughout the Roman period, on the route between Aquae Sulis (Bath) and Venta Silurum (Caerwent). Black Rock, and in the foreground the remains of the ferry ramp. According to tradition, in about the 6th century Caradog Freichfras, king of Gwent, moved his llys or court from Caerwent to Portskewett. Portskewett is mentioned in ancient Welsh stories as one of the three chief ports of Wales. A Welsh poem of around the 7th century, Moliant Cadwallon, describes it as “beautiful Porth Esgewin, the estuary on the border”, and the medieval Welsh phrase meaning from one end of the country to another translates as “from Porth Wygyr to Portskewett”. The harbour later silted up, and is now an unstructured marshy area. Archaeological investigations have revealed wetland structures, including fish traps, with dates from the 6th century onwards. We walked a short distance along the path and found a great place for a coffee. The use of camera timers should come with a health warning. It was a bit dicey getting back across the yawning chasms in the rocks and sit by the boss before the shutter went. Looking at the copious amount of clothing being worn, it was quite warm – honest. The views were impressive on he the small rocky outcrops, and some of the patterns carved into the sandstone and underlying limestone rocks. Despite my gloomy elections above the first part of the walk was OK. It’s not often that you get the chance to walk underneath colossal structures like the Severn Bridge. However, it certainly couldn’t be described as a quiet walk. 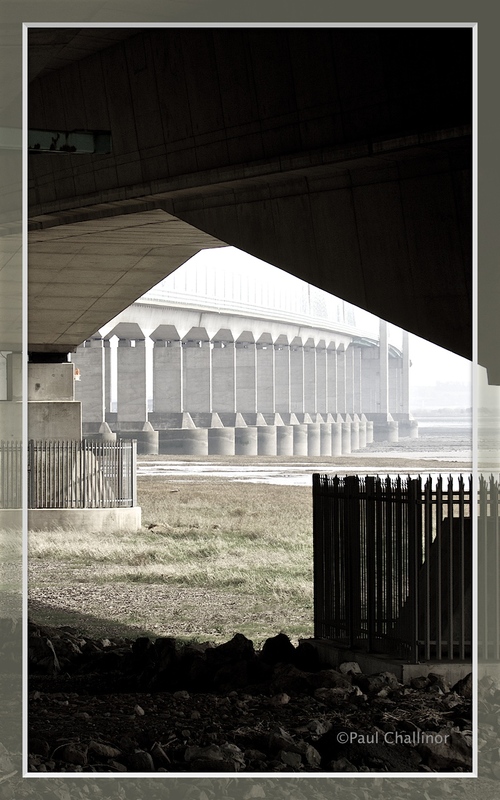 The first couple of miles followed the motorway closely, but eventually came back to the foreshore. But in reality there was nothing much to be seen, and it quickly became a bit of a chore. 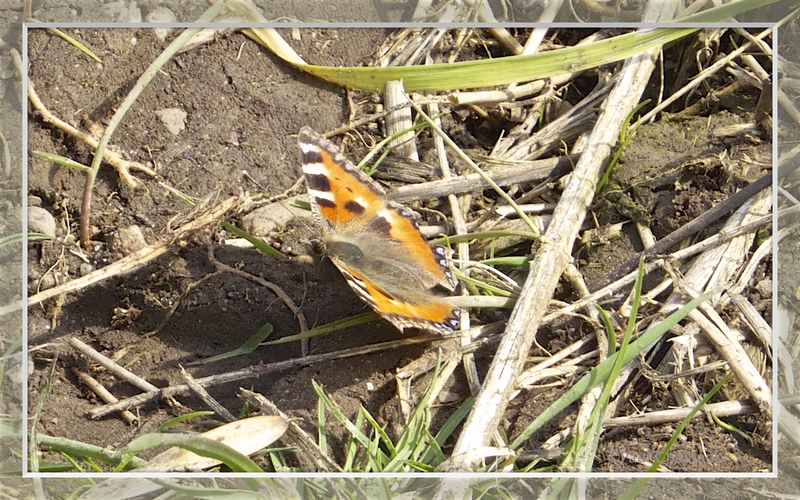 However, spring was certainly in the air, with plenty of peacock and red admiral butterflies taking up territories. as we approached they would launch themselves into the air, but never settled long enough for a decent photo. 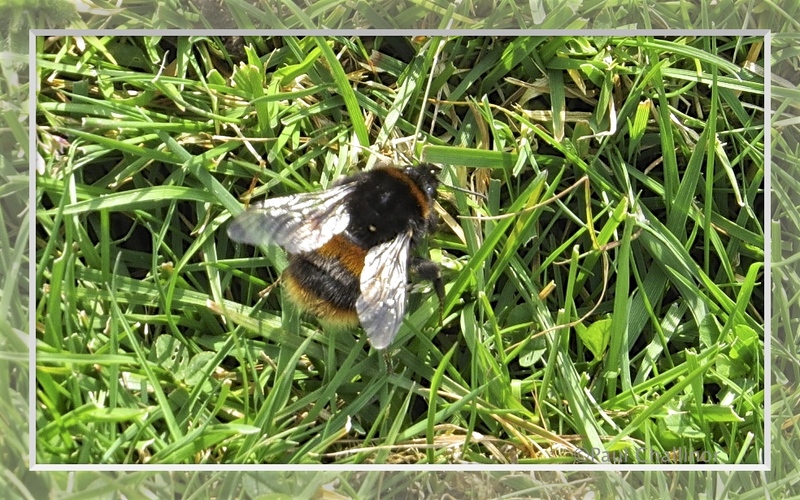 There were also lots of queen bumble bees searching for nest sites. The other problem with this walk was down to the fact I misled Aunty a little with the length. I seemed to suggest before we started out is was about 7 or so miles. It turns out is was 10 miles! And by the time we reached Redwick I was in a lot of trouble, let me tell you. Aunties little legs were worn out.